Witch hazel (Hamamelis): growing, planting, caring. Amazing deciduous shrubs, loved for their clusters of rich yellow to orange-red flowers which begin to expand in the autumn as the leaves fall, and continue throughout the winter. 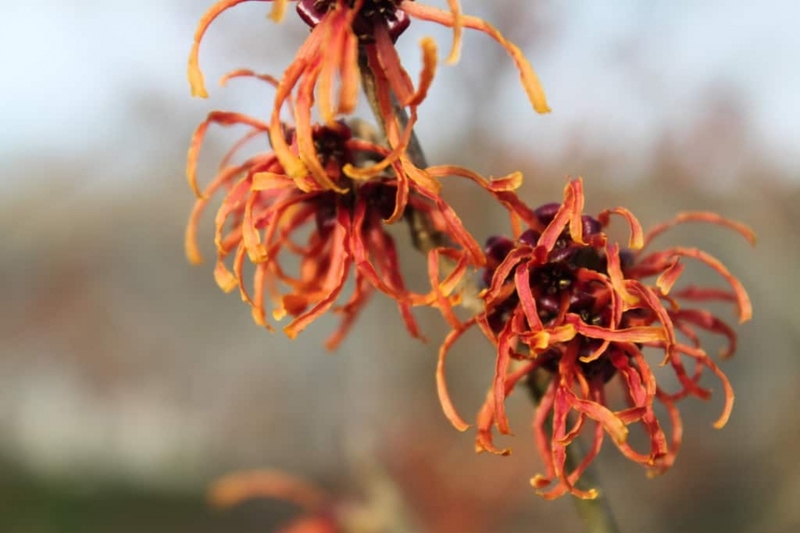 Hamamelis - commonly known as witch haze or Winter bloom - is… a winter-flowering shrub! Its spicy fragrance and spidery flowers in yellow, orange and reds make it a must for the winter garden. Plant from late fall to early spring, in full sun or partial shade, in fairly acidic, drained and moderately humid soils, or in deep, moderately calcareous soils. Make a hole twice as large as the root ball, without mixing the layers of soil - you will put them back in order at planting. Put back some of the earth from the bottom, and place your mahonia at the right depth. Do not bury the base of the plant, replace the soil, tamp, around the roots. Add some mature compost at the end of the planting. Form a hollow and water until it no longer flows visibly, then mulch around the foot. After flowering, each year in March, cut off old branches, intersecting branches, and dead branches.